The Convention on the Control and Marking of Articles of Precious Metals - also "Hallmarking Convention" or "Vienna Convention" - is an international treaty between Contracting States, which aims at facilitating the cross-border trade of precious metal articles. States members of the Convention, recognize that articles, which have been hallmarked with the Convention "Common Control Mark" (CCM) can enter their territory without additional control or marking. Cyprus is a member State of the Convention since January 2007 with sole representative the Cyprus Assay Office. 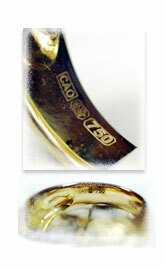 The Hallmarking Convention provides many advantages. Mainly it eliminates the trade barriers in the cross-border trade of precious metal articles. It is also harmonizes worldwide the control and marking of these articles. The 19 member States of Hallmarking Convention are : Austria, Cyprus, Czech Rep., Denmark, Finland, Hungary, Ireland, Israel, Latvia, Lithuania, the Netherlands, Norway, Poland, Portugal, Slovakia, Slovenia, Sweden, Switzerland and United Kingdom.